Mix together marinade ingredients:calamansi juice, soy sauce and pepper. Put the sheets of beef kalitiran on a flat dish and pour the marinade onto the beef sheets, making sure the beef is well coated with the marinade. Set aside for one hour. Remove beef sheets from marinade and lay them out on a flat, clean board or tray. On one eacd of each beef sheet, arrange the following: strips of sausages, eggs, carrot, pork fat and cheese, distributing fillings evenly. Starting from the end with fillings, roll the beef sheets carefully, making sure that all the fillings are intact. 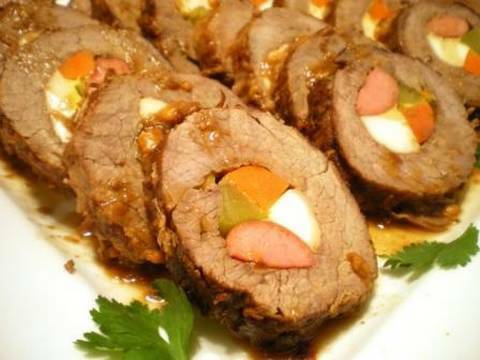 Roll the seets of beef completely until it reaches the other end. Truss the rolls using any kitchen twine. Spread flour on a large sheet pan or on a work table taht has been cleaned and dried. Dredge the morcon with flour. Heat cooking oil in frying pan brown the morcon on all sides in the hot oil. Transfer morcon to a large casserole. Pour in broth and season with salt and pepper. Cover the pan and allow mixture to simmer over low heat until beef is tender(about 4 hours). Remove beef from casserole and reserve the liquid. Let beef cool so it does not crumble when sliced. Slice the morcon and serve on a platter with parsley and bell pepper garnish and with the sauce in which the morcon was cooked.